Photographers discovered 20 years ago that sRGB is a really bad color space for professional photography. So we all changed to Adobe RGB 1998. 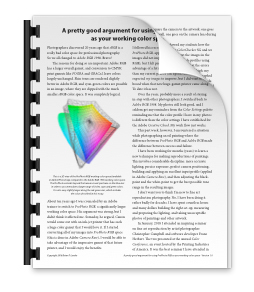 The reasons for doing so are important: Adobe RGB has a larger overall gamut, and conversion to CMYK print gamuts like FOGRA and GRACoL leave colors largely unchanged. Skin tones are rendered slightly better in Adobe RGB, and cyan-green colors are possible in an image, where they are clipped with the much smaller sRGB color space. It was completely logical. 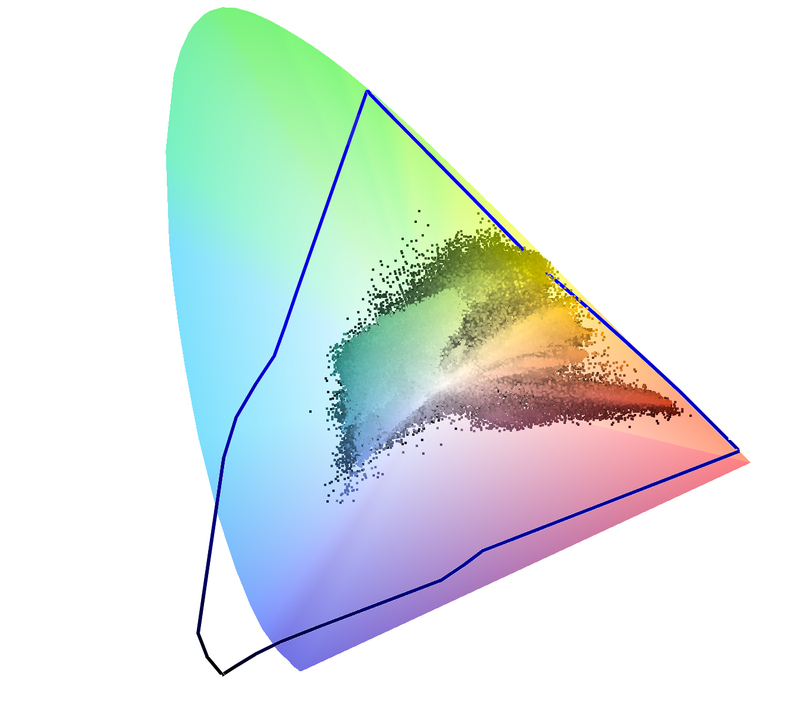 This is a 3D view of the ProPhoto RGB working color space (available in Adobe Photoshop) compared to the Adobe RGB 1998 working color space. The ProPhoto extends beyond the human visual spectrum on the blue axis in order to accommodate a larger range of violet, cyan and green colors. 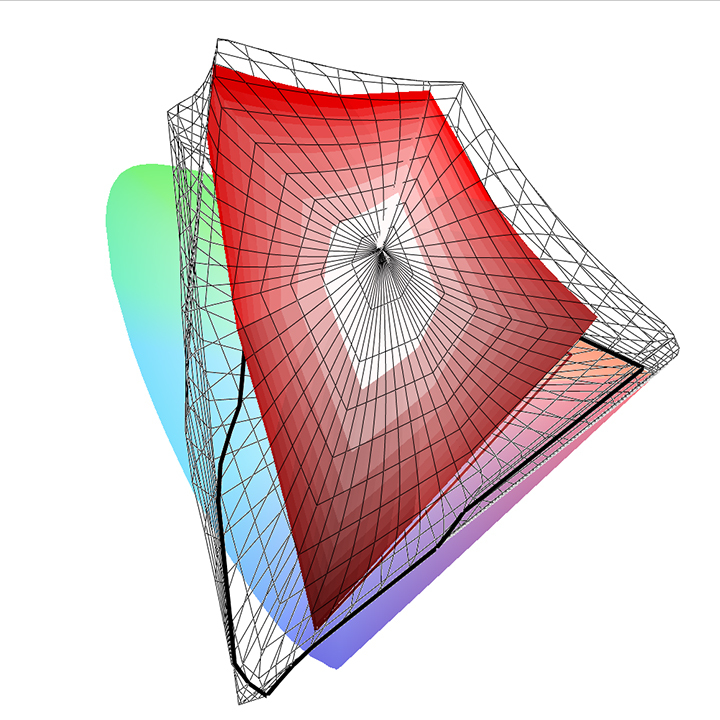 It is also very slightly larger along the red-green axis, which includes the colors described in this essay. About ten years ago I was counseled by an Adobe trainer to switch to ProPhoto RGB, a significantly larger working color space. His argument was strong, but I didn’t think it affected me. Someday, he argued, Canon would come out with an ink-jet printer that has such a huge color gamut that I would be begging for it. If I started converting all of my images then into ProPhoto RGB space (this is done in Adobe Camera Raw), I would be able to take advantage of the impressive gamut of that future printer, and I would enjoy the benefits. Soon, I followed his example and I switched to ProPhoto RGB, applying it to all of my images. My images did not improve (they were just fine in Adobe RGB), but I felt pretty good about my ability to take advantage of a future printer with much more color than my current printer (an Epson 9800). I never expected my images to improve, but I did want to be on board when that new huge-gamut printer came along. To date it has not. Over the years, probably more a result of being in step with other photographers, I switched back to Adobe RGB 1998. My photos still look good, and I seldom get any reminders from the Color Settings palette reminding me that the color profile I have in my photos is different than the color settings I have established for the Adobe Creative Cloud. My work flow just works. This past week, however, I encountered a situation while photographing an oil painting where the difference between ProPhoto and Adobe RGB made the difference between success and failure. I have been working for months to learn a new technique for making reproductions of paintings. This involves much discipline: accurate lighting, precise exposure, perfect camera positioning, building and applying an excellent input profile (applied in Adobe Camera Raw), and then adjusting the black-point and the white-point to get the best possible tone range in the resulting images. I don’t want you to think I’m new to fine art reproduction photography. No, I have been doing it rather badly for decades. I have spent countless hours and many dollars building the right set-up, measuring and preparing the lighting, and taking slightly unacceptable photos of paintings. In January of this year I attended an inspiring seminar on fine art reproduction by artist/photographer Christopher Campbell and software developer Franz Herbert. The two presented at the annual Color Conference, an event hosted by the Printing Industries of America. It was the best seminar I have attended in years. At the end, Mr. Campbell showed two samples of paintings and reproductions that were indistinguishable. Franz Herbert demonstrated BasicColor Input, the software he develops for BasicColor, a German firm that makes profiling and profile editing software. This is a comparison of the ProPhoto RGB working color space (black wireframe) to the image capabilities of a Canon 6D digital camera. The size of ProPhoto is important to capture such a large potential volume of colors captured by that, and similar cameras. As a result of attending that seminar, and doing considerable reading after, I developed a work flow and apparatus for fine art reproduction photography. I built a special wall mount for paintings; I bought clamps and aluminum bar stock to mount my strobe lights in the correct position for this kind of work. I got a new Color Checker SG target from X-Rite, and bought a pair of lasers to aim the lights. In February I got a copy of BasicColor Input, and began the process of learning how to make and use Camera Raw profiles (I have used ColorChecker Passport for years). In late April I assembled all of this in the studio at my university. I brought my own strobes over (they are better than the lights owned by my department). I set up my lights, measured their positions exactly, and then aimed them using the lasers. I bought a Hasselblad alignment mirror on eBay (by mail from Hungary), and I bought a Zig-Align mirror for the Canon macro lens I planned to use for this activity. The two mirrors are used to square the camera to the artwork: one goes on the artwork wall, one goes on the camera lens during the alignment stage. Once assembled, I showed my students how the system works. We set up the Color Checker SG and we made exposure calculations to get the images in the camera – a Canon 6D. We then made profiles using the BasicColor software, and learned that the errors in color from shooting to profile were too high: my average Delta-E was in double-digits. I photographed the painting and opened it using the profile we made. Printing that image to Epson Somerset paper we could see that the color was too orange. Cream colors in the original were just wrong. I worked with the image to make it look better, but it got worse. Back in the studio, I recorded a custom white balance in the camera, a step that I had omitted in the first round (though suggested by Christopher Campbell and Kevin O’Connor). Then I photographed the Color Checker SG again, and made a new profile. This one turned out much better: average Delta-E of 2.46, peak Delta-E of 5.3. Again, I photographed the painting and opened the image in Camera Raw, applying the new profile. On printing it, the cream colors were much better, but still visibly wrong. This is a projection in 2D of the colors in a recent fine art reproduction image I made in the studio at my university with the Canon 6D camera. Notice the colors that extend beyond the triangular gamut of Adobe RGB 1998 at the top-right; these are the cream-yellow colors described in this essay. 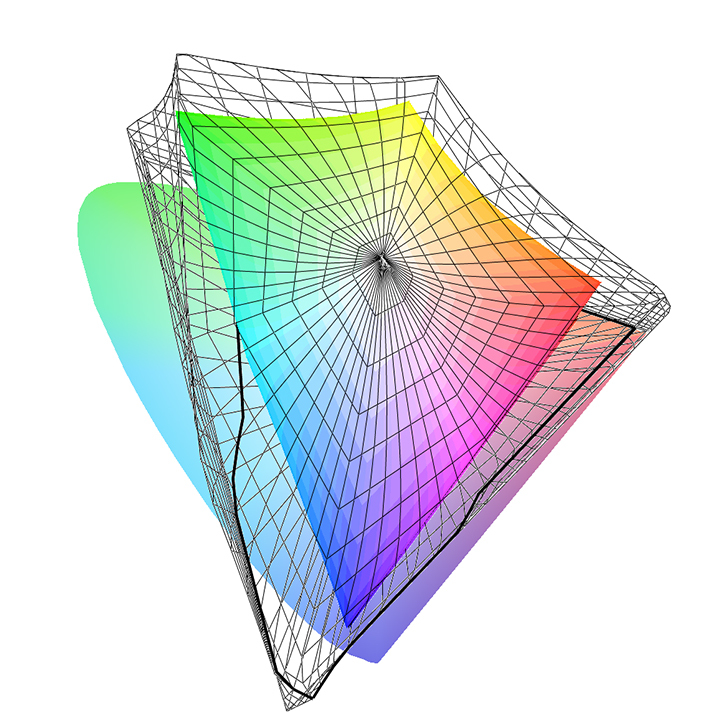 This image was created in ColorThink Pro software, which can plot various color gamuts in 2D and 3D space. In Adobe Camera Raw I changed the bit depth of the photos from 8-bit data to 16-bit data and tried again. The result was the same: cream colors that were orange. I reconsidered everything that I was doing, attempting to figure out how to make it better. I seized upon the idea of the color space, wondering if Adobe RGB is too small for the colors in the painting. I changed the color space to ProPhoto RGB and tried again. Bingo! I could tell immediately that the cream colors had been captured and converted to Adobe Photoshop correctly. 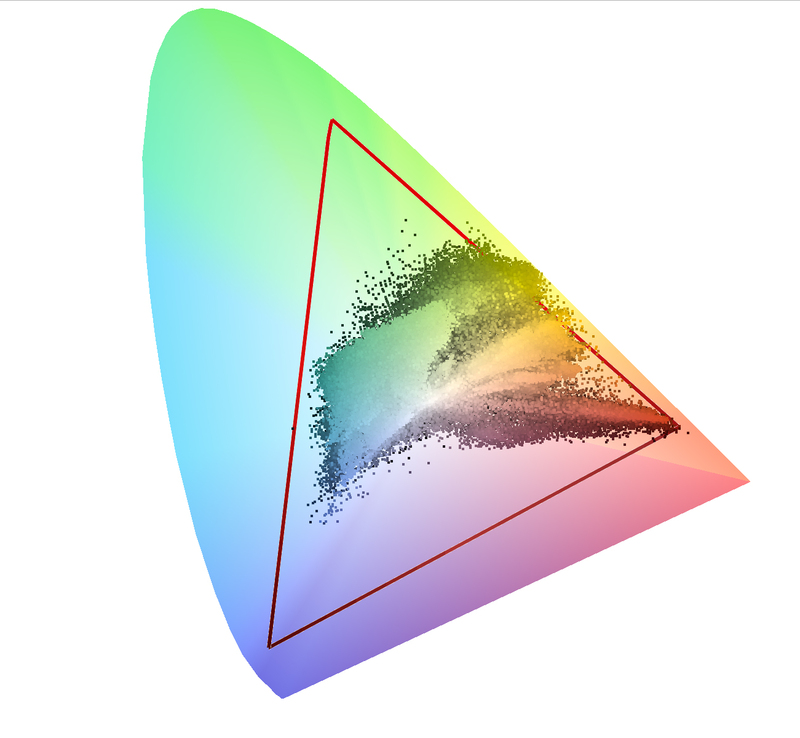 …and this is the same image superimposed on the 2D gamut chart of ProPhoto RGB. You can see that the larger working space accommodates nearly all the colors in the photograph, doing a much better job than its slightly smaller counterpart Adobe RGB 1998. After analyzing the two gamuts side-by-side, I realized that the most significant difference between the two (in this case) is a small strip of land along the red-green axis, passing through the red-yellow-orange areas of the image. ProPhoto RGB is slightly larger along this axis (there is not much room to move there), but this was exactly the area where my colors were being clipped into the smaller Adobe RGB color space, and this was pushing the creams into stronger reds. When I used ProPhoto RGB, the colors were being recorded and passed correctly to Photoshop, and they were remarkably better. The resulting image, and the print I made from it are nearly perfect. It is the most satisfying result that I have ever made. This entry was posted in Color Management, Photography, Photoshop techniques, Printing and Printing Processes, Software, Technology, Uncategorized and tagged Adobe RGB 1998, Blognosticator, Brian Lawler, Canon 6D, Christopher Campbell, color gamuts, ColorThink Pro, fine art photography, ProPhoto RGB. Bookmark the permalink.